Award-winning author Melina Marchetta reopens the story of the group of friends from her acclaimed novel Saving Francesca – but five years have passed, and now it’s Thomas Mackee who needs saving. After his favorite uncle was blown to bits on his way to work in a foreign city, Tom watched his family implode. He quit school and turned his back on his music and everyone that mattered, including the girl he can’t forget. Shooting for oblivion, he’s hit rock bottom, forced to live with his single, pregnant aunt, work at the Union pub with his former friends, and reckon with his grieving, alcoholic father. Tom’s in no shape to mend what’s broken. But what if no one else is either? An unflinching look at family, forgiveness, and the fierce inner workings of love and friendship, The Piper’s Son redefines what it means to go home again. One of my favorite things to hear back during those high school graduation programs is the class prophecy. I think I heard my first class prophecy back in elementary, when our teacher read a prophecy of one batch for us. Then sometime during sophomore year in high school, I wrote an incomplete class prophecy on a whim, set about ten years later, one where I apparently lost contact with most of my high school friends and even crashed into my best friend’s car. And finally, during senior year, I was assigned to write our batch’s prophecy, which was kind of boring now that I remember it. Boring compared to the sort of morbid prophecy that the higher batch had before us, anyway. But again, I love those things because it has that infinite feel to it. I can write practically anything about what our fortunes will be (and because it’s going to be read to everyone, I have to make sure all of us were successful, sort of). It had all those possibilities for all of us, giving all of us in the batch hope that we could all fulfill that prophecy that I had penned. That’s what The Piper’s Son read like for me — a class prophecy. It’s been five years since Saving Francesca, and the little group that I have grown to love in that book has changed. Will is now an engineer in Singapore, and having a long-distance relationship with Frankie. Frankie’s parents are in Italy and she now works in a local pub with Justine. Siobhan is in England, Tara is in Timor, Jimmy is somewhere out there. And Tom. Tom Mackee is lost. Ever since his uncle died in a terrorist attack in London, Tom’s life had fallen apart. When he finally hit rock bottom, he finds himself living with his pregnant aunt Georgie, who’s also deep in her own grief. Tom is going to have to start picking his life back up again, but will the people he’s left behind be there to help him? What can I say about The Piper’s Son that the other readers haven’t said yet? Once again, Marchetta shines in this book. This is one of the best spin-off novels I’ve read ever. Like I said, it reads like a class prophecy, so I was thrilled to read about what happened to my favorite group of fictional friends five years down the road. It wasn’t the same as my “we’re all so successful” prophecies though, because Tom is broken. And it’s with Tom that makes this book so heartbreakingly good. There were so many layers to him and his relationship with his family and friends. I think it was Aaron who once said that he had more personality than Will had in Saving Francesca, and it’s true. I liked that this book gave us a way to know him more than the smart-aleck seemingly bad guy character he had before. I had to marinate on this book for a while before I decided on its final rating. It’s not exactly an easy read, especially with all the issues it tackled. Somehow, this made Saving Francesca seem like a sunshine-y happy book, even if it also tackled pretty serious issues. I guess it’s because Tom was dealing with harder ones, and being a guy, he handles it differently. But after a few days of thinking about it, I finally got to the point where the beauty of this novel has finally settled deep into my bones, and I am just in awe of how Marchetta can keep me thinking about her story and her characters long after I’ve finished reading. If that isn’t a sign of a great book, then I don’t know what is. 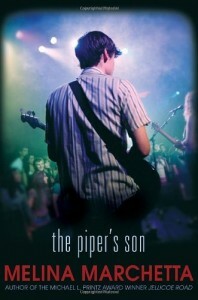 The Piper’s Son is not an easy book to read, but it’s one of those books that you’d want to read. Because a story such as this deserves to be read. It just wraps itself around your heart like that. If you’re off to read contemporary YA books, do yourself a favor and put Melina Marchetta high on your list. I promise you won’t regret it. I loved this one just as much as Jellicoe Road because Melina Marchetta manages to make readers actually feel what her characters are going through – you ache for them, you cry with them and you breathe a sigh of relief when things finally fall into place. She’s an awesome writer and I can’t wait to read more of her work! Thoughtful review, Tina. I didn’t love Saving Francesca so I’ve been hesitant to read this but I’m bumping it up the TBR. That it is five years in the future and fits more in the New Adult category is working in it’s favor. :) When deep emotion and broken characters are done right in a book, they are often become some of my favorites. Thanks Holly! The Piper’s Son makes Saving Francesca look really young. I love that this book shows us how the characters have grown up and moved on. It makes them feel like real people, somehow.